We've been in business, trading as "Heymman Servers" and offering dedicated web hosting services, since November 2011. We started with a single colocation server and we now own multiple cabinets of high-end, high-density servers in 3 different datacenter facilities. Do you own your servers, IP addresses and datacenters? Heymman Servers owns all servers offered, we do not lease, rent or resell anyone else's servers (unless we are specially requested to by our customer). We own most of the access and distribution layer network equipment connecting our servers; we exclusively use Juniper EX series switches. With the exception of very few, small (/29) allocations, Heymman Servers owns all IP addresses assigned to its customers. We are a member of both ARIN and RIPE. We currently own and manage nearly 20,000 IP addresses. We are present in 3 datacenter facilities : 2 in Kansas City, Missouri (a datacenter facility formerly managed by Wholesale Internet, and Joe's Datacenter datacenter facility) and 1 in a datacenter facility in Chicago, Illinois, owned by Cogent, under FDC Server's tenantship. Heymman Servers does not own these datacenter facilities. We rent colocation space and we leverage the remote hands services offered in these datacenter facilities to successfully operate. We also chose not to operate our own ASN and rather use the provider or carrier's ASN (AS174, AS19969 and AS64236). What operating systems can you install? We can install any free operating system on your behalf (CentOS, Ubuntu, Debian, ESXi, etc.). For licensed operating systems (eg. Windows), we can register and install a free 180 days trial for you or you can provide us with a direct download link to an ISO file to use for the installation. You are also welcome to install your own operating system yourself using the IPMI remote console of your server. Do you offer software licenses? Yes, we can sell Windows Server and CAL (remote desktop) licenses. Please contact us for a quote. We do not offer any other software (operating system, control panel, etc.) license. Such licenses must be purchased from your own channels. Do you offer server management services? We do not offer server management services; our servers are sold as unmanaged services. The responsibilities of Heymman Servers are limited to ensuring that your server is powered up, has healthy hardware and is connected to a functioning, healthy network, as described in our SLA. For issues related to the software being run on your server, we typically have to ask you to obtain assistance from your own channels. We can reinstall your operating system on request, if needed. What is your policy regarding abusive content? We understand that service providers often have to deal with lots of abusive content, originating from their end-users. Abuse notices (copyright infringement, phishing attacks, etc.) are manually screened, then automatically forwarded to the corresponding customer. Each abuse notice is evaluated on a case-by-case basis and, except in some particular situations, we allow a minimum of 72 hours for the abusive content to be removed. In case the content isn't removed and the customer isn't responsive, the IP address on which the content is hosted may be null routed. Null routes are immediately removed after being notified that the content has been removed. What is your policy regarding network attacks? Our Kansas City and Chicago datacenter facilities aren't designed to filter dirty traffic from incoming network attacks. In case of a substantial, incoming network attack, the targeted IP address (exclusively) will be null routed. The null route will be maintained until the attack has stopped. If your service has to remain online during an attack (if you require DDoS filtering services), we encourage you to purchase such a service from a third party provider and tunnel the clean traffic to your server. Does your network supports IPv6? We fully support IPv6 in our Kansas City locations. In our Chicago location, we are present in a Cogent owned datacenter facility and our IP addresses are announced directly from Cogent's AS. At this time, Cogent has no IPv6 peering agreement with Google and Hurricane Electric, resulting in a diminished IPv6 support. If this is a concern for you and if you would like to measure how this affects reachability of your IPv6 enabled website from IPv6 only hosts, please contact us to schedule a trial. The following IPv6 DNS servers can be used as an alternative to Google's : 2620:0:ccc::2 and 2620:0:ccd::2. Tell us more about the quad E7-4870 offer? Unlike E3 and E5 (v1) processors, which are based on the Sandy Bridge architecture, the E7 (v1) family of processors is based on the Westmere architecture. Based on PassMark's benchmark, these extremely powerful processors offer compute performance that is similar to dual flagship E5-2698 v4 processors. The Crucial MX300 SSD's, which we provision these servers with, are capable of up to 530 MB/s sequential reads, 510 MB/s sequential writes, 92K random 4K reads and 83K random 4K writes, per drive. To meet the expected level of performance from a RAID array of SSD's, we provision the servers by default with an LSI 9361-8i hardware RAID controller. This controller supports 12Gbps drives and 500+K IOPS throughput, allowing the SSD's to reach their full potential. This controller, based on the LSI 3108, is the latest and greatest controller from LSI and is the same controller integrated on all modern Supermicro motherboards with hardware RAID support. Is there any bandwidth or port limitation? None whatsoever. We do not block any port, we do not filter traffic and we do not throttle ports. These servers are offered with an unmetered 1Gbps or 10Gbps network port. You can expect to be able to use your port at its full capacity 24x7x365. Our 10Gbps network ports are equivalent to FDC Server's unmetered, dedicated 10Gbps ports. Since the ports are single-homed to Cogent, expect 7-8 Gbps available 24/7. Tell us more about the disks performance? 665 to 680 MB/s with Write Back and 540 to 560 MB/s with Write Through. 650 to 660 MB/s with Write Back and 530 to 545 MB/s with Write Through. 580 to 680 MB/s with Write Back and 480 to 760 MB/s with Write Through. 580 to 680 MB/s with Write Back and 645 to 655 MB/s with Write Through. These results go to show the importance of the cache memory of the controller, for sequential writes, and a significant performance gain with the Samsung 850 EVO, when the controller's cache runs out. We equip our LSI 9361-8i controllers with the matching CacheVault module, allowing Write Back to be safely enabled. What's the cost for additional IP addresses? Additional IP addresses can be ordered for $0.50 per month, each, subject to availability. We can also announce customer provided /24 or greater prefixes for a one-time fee of $105, provided that you have an adequate LoA. Do you offer any upgrade for the quad E7-4870 servers, beyond what's shown on the order page? Deploying standardized servers allows us to reduce our overhead costs. In some cases, we can offer additional customization options. Please contact us regarding your requirements. Also, we do not downgrade servers after they were ordered. How quickly can you deploy these quad E7-4870 servers? The setup time varies dependently of several factors. The time required to deploy one of these servers can vary between few hours to approximately 8 business days. Please contact us for a more exact ETA. The server takes a long time to boot (5-7 minutes), why? Most modern dual socket motherboards support up to 16 memory modules, while most modern quad socket motherboards support up to 48 memory modules. Typically, motherboards are made of a single PCB, into which memory modules are directly inserted. To elevate the maximum amount of memory supported, some very high end systems employ memory expansion modules (or cartridges), which are inserted into the motherboard's main PCB. The HP DL580 G7, but also the G8, G9 and later versions as well as Dell R930 and multiple Supermicro systems, for example, employ memory expansion modules to increase memory density. Due to the complexity of these systems, an additional 3-4 minutes is required at POST time to detect all memory modules. The presence of an hardware RAID controller also adds approximately a minute to the boot process. What operating systems are the quad E7-4870 servers compatible with? The quad E7-4870 servers are compatible with all commonly used operating systems, including Windows Server 2012 R2 and Windows Server 2016 (which might require the installation of additional drivers for the NIC). We are happy to assist with the installation of your operating system. Can we disable CPU cores to reduce our licensing expenditures? The quad E7-4870 servers support disabling an even number of CPU cores, meaning that as little as 2 cores per CPU may be enabled (8 cores in total). This can translate into dramatic savings, for workloads requiring a huge amount of memory, but little processing power. Tell us more about the disks performance and the HP B320i RAID controller? The SP SL230s comes standard with an HP H220i HBA (host bus adapter), which is a rebranded LSI 2308. These systems are also equipped with an HP B320i RAID controller (with no cache memory). Note : When creating a RAID array from the HP ACU, the newly created virtual drive must be selected as the primary boot drive in the "Set Bootable Logical Drive/Volume" menu before leaving the ACU or else the system will fail to POST. The screenshots above depicts how to set the bootable drive. - No RAID on HP H220i (1x 500GB Samsung 860 EVO) : 200 to 220 MB/s. - Software (mdadm) RAID-10 on HP H220i (4x 500GB Samsung 860 EVO) : 350 to 380 MB/s. - No RAID on HP B320i (1x 500GB Samsung 860 EVO) : 400 to 450 MB/s. 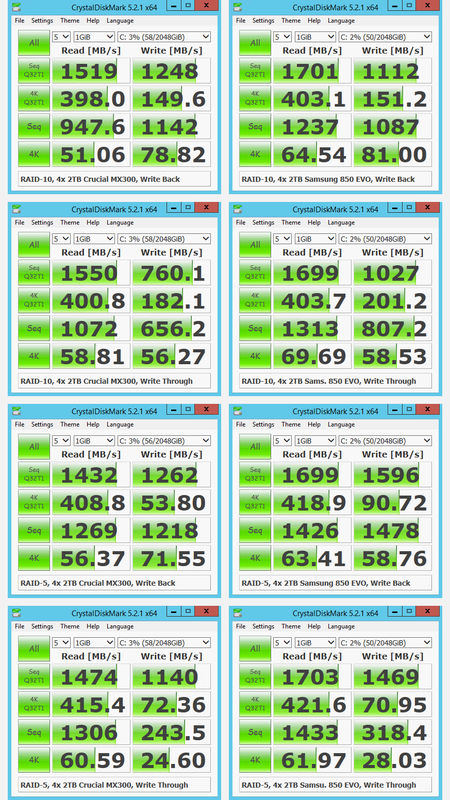 - Hardware RAID-10 on HP B320i (4x 500GB Samsung 860 EVO) : 550 to 590 MB/s (~730 MB/s on a VM with VirtIO enabled). 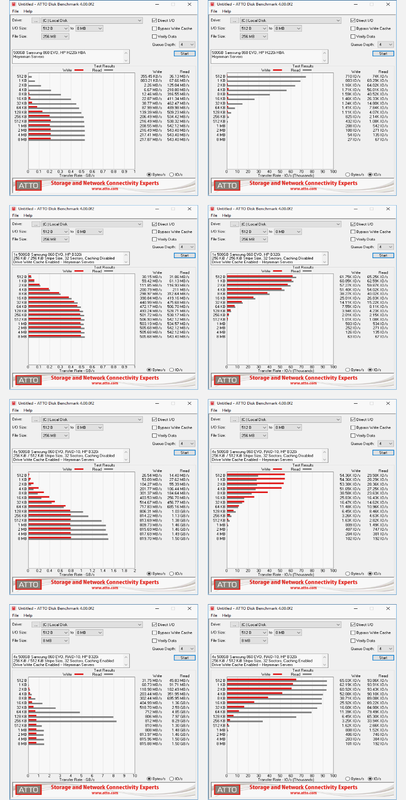 These results show a tremendous improvement when enabling the HP B320i RAID controller. In fact, in the single drive scenario, the drive can roughly reach the full manufacturer's specification of 550 MB/s sequential reads and 520 MB/s sequential writes. In the RAID-10 scenario, we observe that the HP B320i performs roughly 15% less (both in reads and writes) than a modern, top-of-the-line RAID controller in Write Through mode (e.g. an LSI 9361, see the same article in the "Specific to the quad E7-4870 offer" section of this FAQ for additional benchmarks). We therefor conclude that the HP B320i controller does not constitute a substantial bottleneck to modern SSD's, in comparison to modern, top-of-the-line RAID controllers in Write Through mode. On the other hand, the HP H220i HBA significantly bottlenecks the write performance of the SSD's. We therefor strongly recommend to enable to HP B320i RAID controller. The HP B320i RAID controller can be enabled from the "HP Dynamic Smart Array B320i RAID Controller" menu in the system's BIOS. The RAID array can be created from the HP Smart Storage Administrator (ACU) utility. Our tests show that it is crucial to enable the "Physical Drive Write Cache State" setting in the "Modify Controller Settings" menu. We recommend to disable the controller cache setting. We did not measure any significant difference between a 128 KiB / 265 KiB and a 256 KiB / 512 KiB Stripe Size. Heymman Servers will install all Windows, Red Hat based and VMware ESXi operating systems with the HP B320i RAID controller enabled to ensure that our customers benefit from the highest level of performance. Tell us more about the IPv6 LoA services? We offer ARIN and RIPE issued IPv6 /32 and /29 subnets available for rent for $50 to $150 per month. This service is typically requested from customers who already rent servers from another provider and need additional IPv6 addresses, whether it is for website scraping / data mining or web hosting, and are not an ARIN or RIPE member. The /32 prefixes allow up to 4294967296 IPv6 /64 assignments, while the /29 prefixes are 8 times larger. Both are available with no justification and no RIPE or ARIN account is required to start using them. We provide our customers with an LoA (Letter of Authorization), authorizing them to announce the IPv6 prefix in the datacenter of their choice. Managing an autonomous system (AS) or owned network equipment isn't necessary to use our services, as, in most cases, the datacenter's NOC may announce and route the IPv6 prefix to your equipment. The assignment may be used indefinitely or only for a short period of time and will be SWIP'ed to your organization, on request. We can also delegate DNS to you. What is the difference between the ARIN IPv6 /32 and the RIPE IPv6 /32 services? There is fundamentally and functionally no difference between RIPE and ARIN issued IP addresses, for the end-users, except that ARIN issued IP addresses are traditionally used within North America (ARIN service area) and RIPE issued IP addresses are traditionally used within Europe, Middle-East and parts of Central Asia (RIPE service area). As a result, ARIN issued IP addresses will be initially geolocated in North America and RIPE issued IP addresses will be initially geolocated in Europe. IP geolocation can be changed by contacting IP geolocation service providers (MaxMind, Inc., IP2Location, DB-IP.com, ipinfo.io, etc.). It usually takes few weeks for the IP geolocation to be fully updated. In most cases, for RIPE allocations, we will already have requested the change to be done and the IPv6 addresses you will receive will be already geolocated in Chicago, Illinois. It can be changed again, dependently of your needs. The price difference between these 2 services is related to the difficulty in obtaining new allocations from the corresponding RIR. 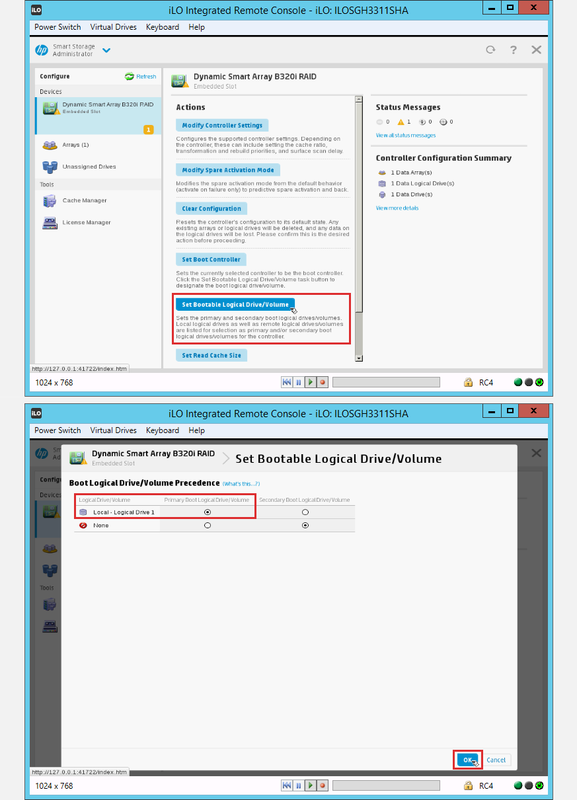 How to use the IPMI management interface of my server (HP iLO 3)? To access the iLO3 IPMI management interface of your HP server, please direct your web browser to the URL ("IPMI address") that was given to you and use the username and password that were given to you when your server has been provisioned. From this interface, in the "Remote Console" tab, in the left panel, and the "Remote Console" menu element, you may launch the IPMI remote console by clicking on "Launch" under "Java Integrated Remote Console", which will provide you with KVM access to the server. Please make sure that your Java security settings allow the Java application to run. To be able to run unsigned Java applets, the IPMI IP address has to be added to your Java "Exception Site List", in the Java Control Panel. From the Java applet, you may also emulate an ISO of an operating system, in the "Virtual Drives" tab and "Image File CD/DVD-ROM" menu element, should you want to install your own operating system. Should it ever be needed, you may also power cycle your server from the "Power Management" menu, under "Server Power". If you need further assistance, please consult the following video tutorial or contact us. Your browser does not support HTML5 video, please update it to be able to view this video.